Mount Teide is the highest point on the Spanish island of Tenerife and rises to 3718 m altitude. Mount Teide is an impressive volcano. The volcano is a popular tourist destination for lovers of volcanoes and climbing from around the world. Mount Teide is located within the Teide National Park. More than one hundred thousand years ago, the huge volcano that is located next to Mount Teide exploded. The walls of the crater of the volcano caldera were formed, in which the volcano Teide resides. Nowadays Teide is a dormant volcano, its last eruption was in the early twentieth century. In the eighteenth century there was a huge explosion that destroyed several villages. The crater is linked by a gondola to Mount Teide. On top of Mount Teide you can see all the Canary Islands. Teide volcano is a typical stratus- volcano, which is a proper cone shape inside the caldera, located northwest of the island of Tenerife. The age of the volcano is about five million years. In the caldera of the volcano is magnificent frozen lava flow and minerals of different colors and types. Teide’s Volcano is the main landmark of the island and can be seen from the board of some ships that are over a hundred miles away from it. The silhouette of the mountain, which now appears, then disappears into the morning mist has been unleashing the imagination of sailors since ancient times. 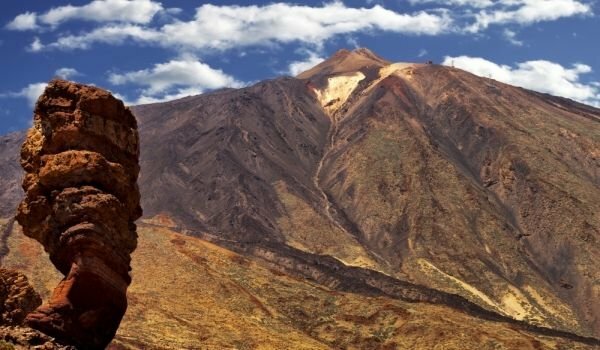 On the western slope of the volcano Teide is its subsidiary volcano Pico Viejo, which rises to a height of 3134 meters. Near volcanic rocks are interesting forms, which have interesting names - like the Queen's slipper, Finger of God. Teide Volcano is the symbol of the Canary Islands and provides tourists with very scenic views. For this reason many photographers from around the world arrive on the island, to perpetuate the beautiful volcano. Often, on the top of the volcano can be seen snow. The name of the volcano Teide comes from an old Spanish word meaning grave. In ancient times, the Spaniards believed the volcano is one of the gates to hell and its surrounding area is inhabited by evil spirits. Worst of them was the evil spirit Guayota, flattening entire villages and towns. If tourists climb to the summit of the volcano with convenient gondola, they will avoid a long and tiring climb, which can be done by experienced climbers. But when it comes to the highest point of Mount Teide, it offers a magnificent view. Tourists wishing to explore the mouth of the volcano Teide must obtain special permission from the Teide National Park, for which, however, you must apply in advance. When departing to Mount Teide, visitors should be aware that their clothing is essential – the cold weather requires warm clothing and appropriate footwear. Around the volcano Teide there are many rock formations that impress with their fantastic forms.